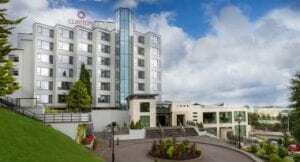 Located in Tivoli, less than 3km from Cork city centre & 11 km from Cork International Airport, there are various convenient transport options available for guests travelling to Clayton Hotel Silver Springs. Driving time approx 15 mins (depending on time of day & traffic). ● Take a right at the top of the flyer and then a right and left into the hotel. More information on getting to our hotel near Cork Airport. ● On approach from the N8, before the Jack Lynch Tunnel follow the signs for the city centre at the Dunkettle Roundabout. ● Continuing for city centre take the first exit at the next roundabout onto the dual carriageway Lower Glanmire Road (sign posted city centre). ● Take the first exit left signposted Clayton Hotel Silver Springs which will take you up to the Tivoli Flyover. ● At the lights turn right, then right again, and the hotel is on the next left. ● Upon arrival in Blackpool, passing the Blackpool shopping centre on your left, at a set of traffic lights on a T junction bear left onto North Link Road – R635 (signposted for Dublin N8). ● Continue to follow the road for approx 3km. ● On approach down the Mayfield Hill follow the signs left for the Clayton Hotel Silver Springs. ● At the Bandon Road Roundabout in Cork follow signs for Dublin, which will take you to the Jack Lynch Tunnel. ● After going through the Jack Lynch Tunnel follow signs for the City Centre. ● Take a left off the dual carraigeway onto the slip road for the Clayton Hotel Silver Springs exit which will take you up to the Tivoli Flyover. ● At this junction take a right turn followed by another right and the next left will take you to the Clayton Hotel Sliver Springs. We are pleased to offer complimentary hotel parking to all guests visiting Clayton Hotel Silver Springs. An electric charging station is available. Cork Kent Station on Lower Glanmire Road is very close to the hotel. Take a taxi from the rank outside the station – journey time is approximately five minutes. The station is within walking distance from the hotel – you should allow 20 minutes for a brisk walk or 30 minutes at a more leisurely pace. In addition to being a hub for regional and national services, a scheduled bus service operates from Cork Airport to the City centre. From Cork Bus Station, we recommend taking a taxi to the hotel – journey time is ten minutes. Car hire is available from Cork city centre and Cork Airport. You can book your car rental online prior to travel with Irish Car Rentals.